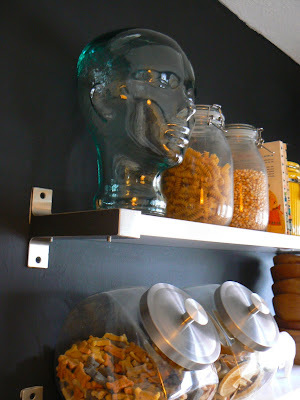 I've wanted this recycled glass head from Pier 1 for about a year (just looked it up, I pinned it 44 weeks ago). For only $19.95 I should have just bought it a long time ago but you know, $20 adds up so I never jumped on it. Thankfully, all things work out for the good of those who wait (that is the epitome of bad paraphrasing and contextual abuse but... I do what I want) because I just got it as a gift last week. Yay! Pretty much everything looks good on these shelves so she is there for now, but I'm sure she'll move around. She was made in Spain and she's green and I love her.